Charging carts are designed for classroom visibility. A dedicated space means easy device access and charging while also being able to monitor devices. Most carts have safety measures such as inside cable management reducing the likelihood of a rat’s nest of cables while other carts have a lock feature to keep devices secure. 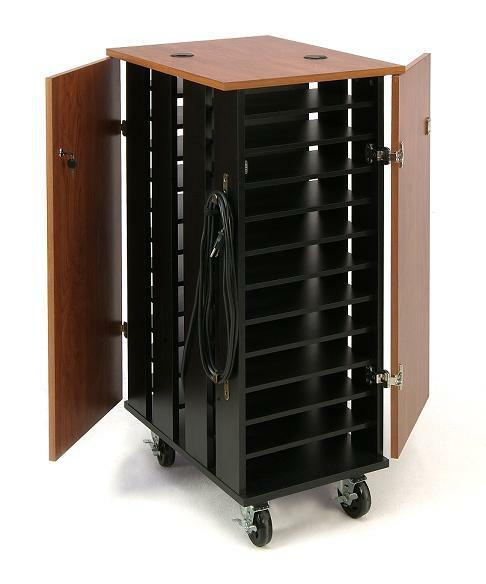 The Oklahoma Sound TCSC Tablet Charging Cart combines ample access with solid cable management as well as security. Having one designated area ensures everyone knows the go-to place for electronic classroom devices. Assigning your students a number based on their position in the alphabet and numbering the laptops and tablets so they use the same one each session is a great way to keep tabs on the maintenance, care, and proper storage of these devices. However, make sure your seating arrangements or the numbers are in a different order so you don’t have a group of ’20s’ or ’10s’ crowding each other at the charge cart. The Jonti-Craft Tabletop Charging Station is a great solution for quick device access and storage for changing lesson plans. As a teacher, you already have enough action items to worry about. Appointing a student as a dedicated “manager” to ensure all devices are stored, charged, and accounted for, ensures seamless execution of lectures and assignments while teaching the monitor responsibility and accountability. You can also increase student enthusiasm and classroom involvement by incentivizing the job of “Monitor” by offering extra credit points each week if all devices are stored, charged, and accounted for and allow interested students the opportunity to do the job and earn as well. Because learning environments come in different shapes, sizes, and number of students, Worthington Direct has a comprehensive selection of A/V equipment that can modernize and make class time more efficient. Be sure to check out our collection of Tablet & Laptop Storage Carts and we are more than happy to help you choose the optimal solution for your learning environment!